The Capital Medical Society is pleased to announce Dr. Andrew Wong as the recipient of this year's I.B. Harrison, M.D. Humanitarian Award. Each year this award is presented to a physician who demonstrates dedication to the humanitarian values we associate with the late Dr. I.B. Harrison. These values include: compassion, service, respect, wisdom and integrity. Compassionate (adjective): feeling or showing sympathy and concern for others. Dr. Andrew Wong, a board-certified orthopedic surgeon, is described by many of his colleagues using this four syllable word: compassionate. He strives to be compassionate toward his patients each and every day, a quality that would make Dr. I.B. Harrison proud. Dr. Wong was born in Milwaukee, Wisconsin, but at the age of four, his family moved to San Francisco to follow his father’s dream of becoming an orthopedic surgeon. Dr. Wong’s father took his orthopedic surgery career very seriously, and in turn, missed a majority of Dr. Wong’s childhood. This led Dr. Wong to form a negative view of medicine. Eventually, through athletics and his years of gymnastics, Dr. Wong slowly grew to respect and appreciate the orthopedic surgery profession. It was in high school when Dr. Wong came to the realization that, despite the personal sacrifices required of the medical profession, he wanted to follow in his father’s footsteps and become an orthopedic surgeon. He obtained his medical degree from Tulane University School of Medicine in 1989. While at Tulane, he served as President of the Student Advisory Board for Admissions, which was responsible for college pre-med counseling and medical student orientation, and was awarded the Tulane Medical Alumni Association Student Recognition Award for his demonstration of scholastic achievement, contribution to the medical center, and promise of achievements and leadership as an alumnus. He completed his orthopedic surgery residency at the University of Florida and fellowship in sports medicine and adult lower extremity reconstruction at the University of Texas Health Science Center in San Antonio, Texas (UT Health San Antonio). It was at UT Health San Antonio that Dr. Wong met his role model in medicine. Dr. Jesse DeLee, a long-time orthopedic surgeon, served as the course director. Dr. Wong strongly believes that the year he spent under Dr. DeLee was the most formative and taught him how best to practice as an orthopedist. Dr. Wong has a passion to mentor future physicians, especially those with an interest in orthopedic surgery. He is an Associate Professor at Florida State University (FSU) College of Medicine and has received many accolades for his teaching skills, including Clinical Educator of the Year, Outstanding Clinical Professor, and Top 10 Best Faculty Preceptors. One of his greatest achievements was hiring three of his former medical students to join TOC: Drs. David Alvarez, Matthew Lee, and Brian Zirgibel. In 2016, Dr. Wong became a Clinical Instructor for the Alabama College of Osteopathic Medicine. He has been involved in many areas of the medical community. He currently serves on the Board of Directors at Tallahassee Memorial HealthCare (TMH) and previously was a member of the Surgical Case Review Committee. Starting in 2018, he has been the Treasurer on the TMH Board of Directors. He has been Team Physician for several local athletic programs, including Leon High School, Florida High School and Gym Force Gymnastics and Athletic Training Center. He has also been a volunteer physician in the Capital Medical Society Foundation’s We Care Network for many years. To further expand on Dr. Wong’s commitment to the orthopedic field, he has served as past president of the Florida Orthopedic Society. He was instrumental in their development of guidelines and standards of professionalism for the specialty. He has also been actively involved in the American Academy of Orthopedic Surgeons (AAOS). He served on the Executive Committee of the Board of Councilors and on the Editorial Board for the AAOS NOW news magazine. He currently serves as an instructor for the TeamSTEPPS training initiative, a hospital patient safety improvement workshop series. Also, he proudly serves as an instructor for their Communication Skills Mentoring Project, where he was selected to train orthopedic surgeons and residents in physician-patient communication skills and techniques. 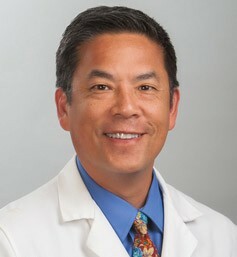 According to research conducted by the AAOS, it was suggested that, “patients perceived orthopedic surgeons as ‘high tech, low touch.’ In other words, while patients gave these physicians high marks for their skills in the operating room, the same was not true when it came to listening and communicating.” Dr. Wong and the AAOS are optimistic that this project will improve orthopedic surgeons’ communication skills. Dr. Wong received the Achievement Award from the AAOS for his many contributions to education, research, and advocacy in orthopedics. Dr. Wong has also reached out to those in need outside of our community by going on medical missions to Guatemala and Uganda. He feels strongly that he needs to use his skills for the greater good. During one trip to Uganda, he vividly remembers treating a nine-year-old boy from the Congo. He and his uncle had walked for three days in hopes that they would find someone to help them. The boy had broken his arm months before and was unable to use his elbow. Due to his injury, he was no use to his village and his future limited. Thankfully, Dr. Wong was able to operate and restore movement in his elbow. Dr. Wong said that each mission trip was an emotional journey because they are taking care of people that would likely not be able to get the treatment they so desperately need. In the United States, we tend to take the accessibility to medical care for granted. After seeing firsthand, the lack of basic medical care in these countries, he feels privileged to have lent a helping hand. Dr. Wong has contributed to many presentations in our local community and afar. In 2016, he presented on a topic that is very important to him, physician-patient communication, at the FSU College of Medicine Grand Rounds. He has presented at the AAOS’ annual meeting several years on topics ranging from communication and situational awareness to difficult conversations in orthopedics. He has also presented on various orthopedic procedures at FSU College of Medicine, University of Florida, and the Florida Orthopedic Society’s annual meetings. He is a loving husband to his wife of 26 years, Ann, and a proud father to their three children, Cameron, Christian, and Hannah. On behalf of all those associated with the Capital Medical Society, congratulations to Dr. Andrew Wong.